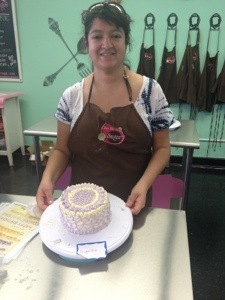 Today I attended the Basic Cake Decorating class at Give Me Some Sugar with my friend Stacy. It was a lot of fun. Even though I knew the basics, this reinforced how to do it right. 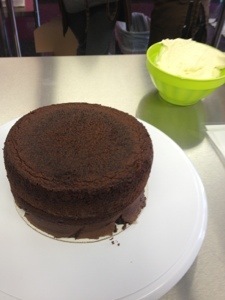 It started with how to frost a cake. We also learned how to make rosettes, lines and dots while holding the piping bag correctly. 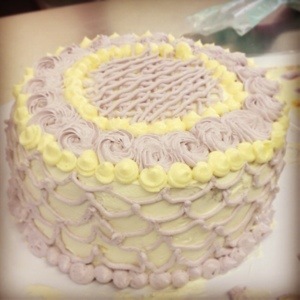 It was so nice for someone to demonstrate how to pipe frosting. 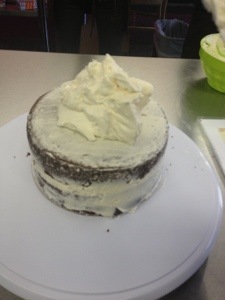 The best part was at the end when we decorated our cakes with our new skills.